What better way to bring The Strain’s vampire infestation closer to the forefront than with an eclipse (or occultation, as astronomers would call it). It’s simple, really: An eclipse is practically vampire Christmas. The more out-in-the-open vampire presence in “Occultation,” The Strain allows more of the characters to react accordingly, even when they still don’t quite know the rules to the game. At least, not yet. Gus realizes that Eichorst isn’t just some creepy German criminal—he’s quite possibly the actual Devil. Fet (poor, broken Fet) finds a purpose that he presumably thought he had as a typical exterminator. These secondary protagonists now have a true reason for being, which is already a big step up from the former’s questionable introduction in “The Box” and the latter’s somewhat useless role in all of the prior episodes (with the exception maybe being “Night Zero”). 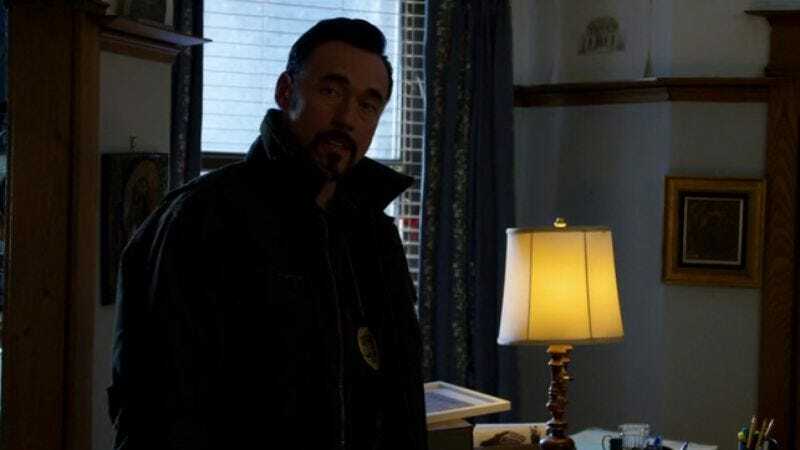 Plus, with the vampires making more public debuts this episode, The Strain also allows the characters to truly be active participants in this impending war. Arguments about the show being slow stem from the passive nature in the first couple of episodes, but with each passing week, the show is making up for that lack. Now, it’s clear that vampirism is spreading rather quickly through New York, and there’s now no reason for the protagonists to stand on the sidelines. It’s invigorating, and the it’s the type of momentum the show has needed. Obviously The Strain couldn’t have jumped right into that from the start, but there could have been some forward momentum. That’s what this episode finally has, along with an increased reason for being in some of its characters. Look at Fet’s scene with his father: That scene alone evokes more emotions than anything having to do with Eph and his family. 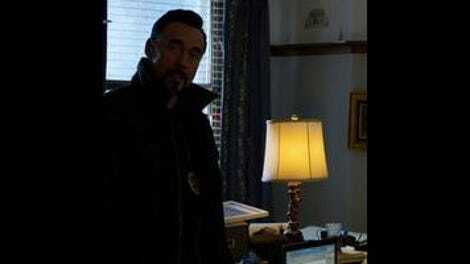 The episode also has Fet putting into words why the vampires on The Strain are such a threat. Last week’s episode had the flashbacks to Setrakian’s time in the concentration camp, but that attempt at some perspective ended up being more heavy-handed than intended. Here, Fet says it in words that are true to him: The vampires are vermin. In their simplest form, the vampires in The Strain reproduce like bunnies. There’s no need for a blood exchange here—if you’re a victim of the vampire’s bite, you are doomed. Everything about The Strain’s vampires are black and white, which makes it easy (well, easier) to set a course of action. The black and white nature of the vampires here is part of why Nora running away back in “It’s Not For Everyone” was so frustrating. Vampires in this mythology are parasitic worms that completely change the physiology and mental state of their hosts. It’s not a matter of lack of soul—it’s complete and utter destruction of what makes these people humans. It’s a mental, spiritual, and physical change to something else. As a scientist, one would expect that Nora is able to compartmentalize even a little bit and understand that the people she’s so averse to killing are neither people nor living. Her realization in this episode that she is in over her head and decision to go with her mother to Setrakian’s place has him deem her as “ready,” but it remains to be seen as to whether or not she really is. Still, with as straightforward as the vampires in The Strain are, there’s still something fascinating about them. The the fact that religious emblems have absolutely no effect on the vampires is an interesting choice—with the vampires being more of a scientific anomaly, it makes sense that religion would have no effect, but at the same time, it’s clearly the show making a very specific point. The point that God isn’t here, and even if He is, there’s nothing that He can do is fairly bold. Sure, such words have come from Eichorst himself, but it’s one thing for an evil Nazi vampire to say such a thing—it’s another for it to be true. The priest couldn’t be saved. Ansel and his wife weren’t going to be saved. Gus’ mother isn’t going to be saved. The Strain may be calling its heroes to action now, but it’s ultimately saying something really bleak. All these characters have are themselves, which goes back to why they all need to be active. That’s why they need to use their brains. It’s been a topic of all of these episodes, but here in “Occultation,” there’s less a lack of logic then there are simple blissful ignorance and skepticism. It’s a very human flaw that is difficult to begrudge any of these characters for having, but it is also the type of flaw that makes one cheer when the FBI agents who refused to believe Eph get caught by the traffic vampire. When you watch horror and tell a character “Don’t go in there,” it’s really their own fault for going in there. Here, character flaws are finally starting to catch up with the characters. Eph gets caught because of his duties to his family, and Nora has a sick mother in tow who will probably only be more of a headache than she’s worth. Based on his backstory, Setrakian is clearly supposed to be a man in his late 80s or his 90s, so as enjoyable (really, badass) as it is to watch him go about his merry Van Helsing way while everyone else stands around, that’s the type of thing thing that will eventually strain (no pun intended) credibility. Hopefully the character becomes a blueprint figure for the other characters, because even with his medication and age hindering his abilities as a vampire slayer, he’s still able to get the job done. It truly is impressive, and tt’s a commitment that characters like Eph and Nora should have themselves. After all, even without the CDC, they still have a mission to save people: It just involves a little more decapitation. Eph being on the run from the FBI for the disposal of the Captain’s body after last week’s meeting with his boss is really only saved by Eph’s very real realization that Setrakian was right about everything. In fact, if the next few episodes were just random characters—including that very blunt taxi driver—coming to the realization that Setrakian was right, a lot of work could get done in a short time. That’s how you combat the vampire apocalypse. Billy Zane Hair Update: “Look, I know too much. Maybe that sounds crazy.” This week’s hair is the exact hair of the type of person who would say such a line. “I wish I could forget like you.” I understand the intention of the line, but holy insensitivity, Nora. Your mom has Alzheimer’s. The award for most horrific part of this week’s episode should go to Eichorst’s one-man prison. It’s just a highly disturbing scene in an already disturbing series. MINOR SPOILER FROM THE BOOK: From the comments in last week’s episode, someone mentioned that the CDC boss is actually secretly working for the Stoneheart Group. There’s no follow-up in this episode, but that both helps the otherwise nonsensical reaction he had to the video and makes the Stoneheart Group maybe a little too powerful. Eph’s family (and Matt) remain an obstacle in the show’s momentum. However, Inga Cadranel (Orphan Black, Lost Girl) returning with her Queens accent makes it a little worth it. “Please. I’m a Queens girl. We never leave.” Calling Nora “Eph’s spicy sidedish” on the other hand, was not as ridiculously great. No Bolivar or Joan in this episode, which actually made me think about how the plane “survivors” factor into the story as a whole. While their slow descent into the vampirism is fascinating at times, once they’re fully turned (and eventually killed), then what? Ansel showed that their slow descent into full vampire isn’t what results in the type of sentient vampire that Eichorst is, so what exactly is the reasoning behind it (other than there just being survivors for distraction’s sake)? Gus’ friend Felix is apparently 12 years old, since he just couldn’t help himself and had to open that body bag. Then the worms got him. R.I.P. in advance, Felix.